Trump commission seeks to eliminate non-white non-GOP voters. Unholy alliance: Kennedy, Nation of Islam, anti-vaxxers. Link. Idiocracy was a roadmap. Ape strength: humans walk, chimps climb. Link. Fast/slow twitch composition. Chimps are not super strong. Link. For years after I could sneak into the closed pavillions. Robocalypse: now or soon? Central bankers debate. Link. It started long ago. Link. We are in a ready position. Link. Pulling ahead of Apple without OS dependency. Photos for macOS High Sierra. Link. No Library merge, no Library share, no Aperture replacement. MarsEdit 4 to support microblog. Link. I like subject/response but great to see ME 4 at last. Link. There is always someone more extreme. Lesotho: the case for managing fertility. Long term travel: a guide. Link. Population of tourists grows exponentially. Republican governors are not like GOP Congress. Link. Not the same party really. Nobody thinks McConnell’s cruelty is over. Link. GOP attack on health will not stop. Extended NYT essay on SETI, METI, Drake equation and Fermi paradox. Link. Best I’ve seen in years. It didn’t work. For years my gmail ads have been uninteresting. Unlike my Facebook ads. Link. A flaw in migration from HFS+. Amazon Echo Show is fabulous for care of a vulnerable person. Link. Elder. Special needs. Physically disabled. I’ve asked for this for 15 years. Gruber tries to defend iPad. Again. Link. And fails. Book neglect, not multi-user, few advantages over iphone. Link. Only wraiths need apply. All those “Democrats and white middle class” articles explained in four lines. Link. Dems will quietly retreat on civil and women’s rights. Minnesota adoption assistance and disability support. Uber’s doom: its primary advantage was breaking rules. Link. Lyft can live with the law. Link. Josh rips CNN faux journalism. GOP media: it’s great Russia manipulated US elections. Link. Makes sense in their world. Multiverse is simpler than universe. Oliver Stone shares Trump’s love of the dictator. Link. Stone is a wart. are a red herring. Think productivity. Emily’s Safari used 2GB cellular this month. Faces of American evil: two wealthy pychopathic psychologists. Chinese-American VC NYT oped on AI and mass disability. Link. Nothing new, but novel voice. Nobody wants men to be home health aides. Link. Jobs for non-college men going fast. Rural areas flailed by Amazon’s scourge. 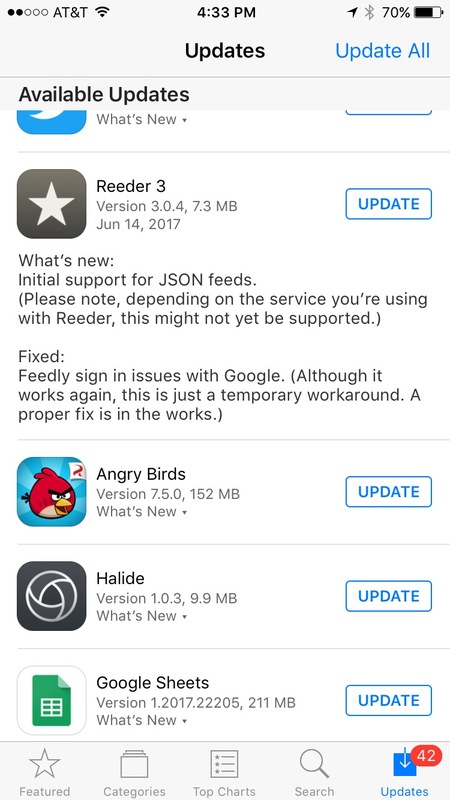 Reeder.app adds JSON feed support. Foreign ambassadors call NSC because State Dept comatose. Link. GOP war on government effective. Google Sheets supports email based change notification. Link. Not RSS, and not gDocs. Good when sheet stores user form data submissions. Link. Up to 16bits, much better compression, sane metadata, lots of patents. Whether Adobe? Link. “Could not enable permissions for volume __ : please restart your Macintosh”. Remember the Carrier plant jobs Trump “saved”?